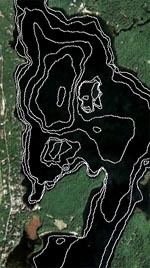 PPA has a new depth map of Panther Pond, and a depth contour overlay for Google Earth and other GIS software. The map is 11" x 17", printed on heavy paper (and much clearer than this picture), suitable for framing or laminating. The map is availabe free to current (i.e., paid-up) members. Maps will not be mailed. To get your map, call (207) 655-3381 and arrange to pick up the map at the Jensen house while you're in Raymond. 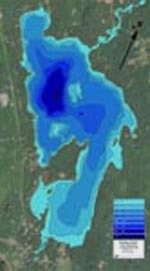 If you do not have GIS software, Google Earth is available free. Just go to Google, find Google Earth, and install it on your computer. Some older GIS software is unable to use .KMZ files. If you need a .KML file, please email ppa@raymondmaine.org to request it.